Who needs a free-scoring centre-forward when you can get goals from all areas of the park? 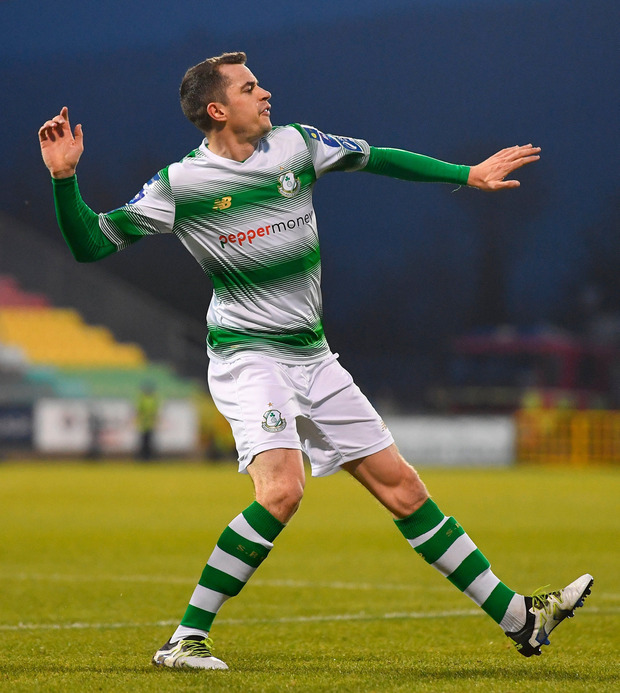 Shamrock Rovers are living proof that you can sustain a title tilt without a reliance on one man, as midfielder Sean Kavanagh and defender Roberto Lopes delivered the goals to earn this victory. Rovers are looking more and more like champions with each passing week. There were rumblings in pre-season about the lack of frontmen in Stephen Bradley's squad, and the main striker in the Rovers panel, Aaron Greene, has scored just twice in 10 games this season. But manager Bradley has made amockery of those who wondered about the balance of his squad as the midfield and defence have delivered time and again, and a 2-1 scoreline last night does not reflect the Hoops' dominance. Alan Mannus in the home goal was a passenger until Aaron Drinan nicked an injury-time consolation goal. 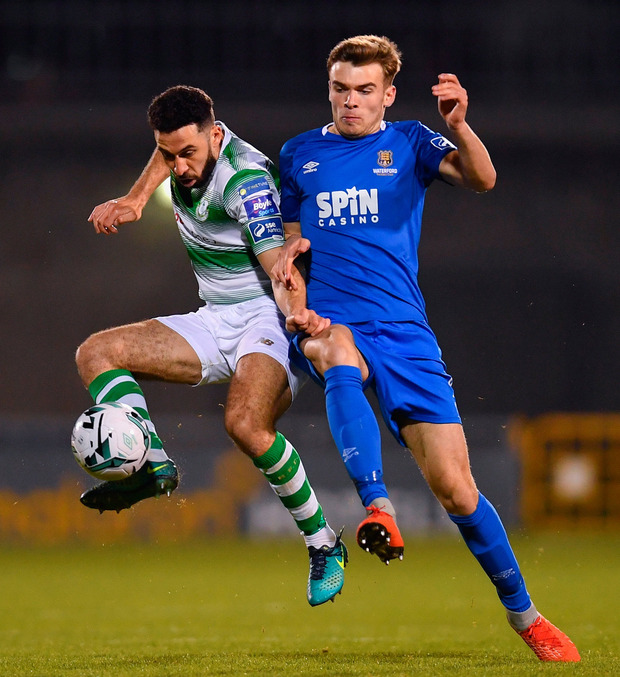 It was a very good night for Rovers as the side most likely to challenge them, Dundalk, lost for the second game in a row, that 13-point gap between the sides already looking like a chasm that cannot be bridged by the under-pressure champions. 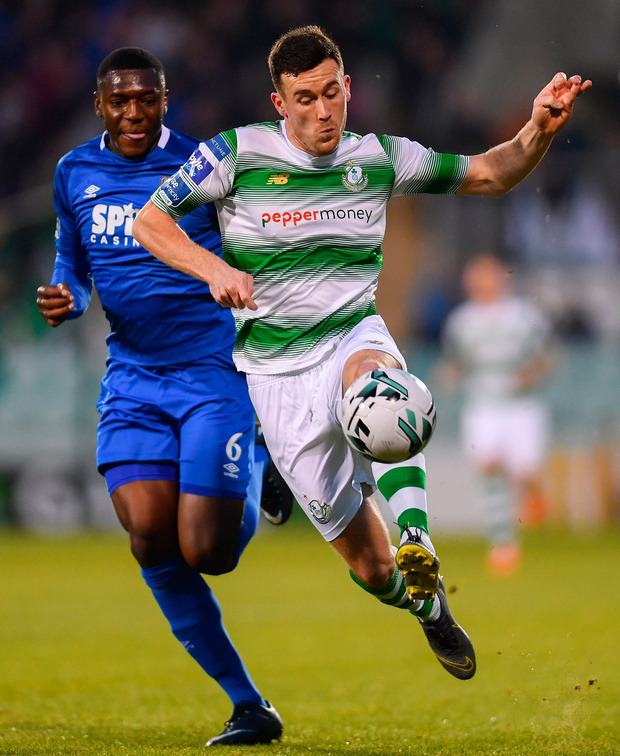 Waterford took points off Rovers last season, but they came to Tallaght Stadium on the back of a 4-1 beating by UCD. The Blues have been erratic this season while the Hoops have been blemish-free in recent weeks and that was the story of the game, with Rovers in control from early on in front of a crowd of 2,821. Waterford did have some possession, and potentially some good moments early on, with a shot on three minutes from Zak Elbouzedi and another effort four minutes later from Bastien Hery, but both efforts were well wide. Rovers never looked concerned, content with gentle prodding from midfield for their chance to come while Waterford looked nervous. A slip in possession, in the box, by Damien Delaney as he tried to clear a Ronan Finn cross led to a corner but nothing came of it. Rovers kep probing, and there was a note of intent when Blues defender Maxi Kougoun had to clear when Greene was in a dangerous area on 23 minutes. On 26 minutes, the breakthrough come. Some clever play on the left allowed Trevor Clarke to send in a cross and left winger Sean Kavanagh had time to compose himself and send a shot past Matt Connor for his second league goal of the season. With Jack Byrne's trickery on the ball Rovers were a constant threat and only for Kougoun's efforts, Rovers would have scored again on 39 minutes: a Finn ball set up Greene but former UCD man Kougoun cleared off the line. Rovers owned the ball for long spells as Waterford could just got get any relief. Finn went close with an effort on 60 minutes which needed a save from Connor, who was beaten again on 67 minutes when Lopes headed in Byrne's corner. Apart from Drinan's injury-time headed goal, the Blues offered no threat. Shamrock Rovers - Mannus; O'Brien, Grace, Lopes, Clarke; Watts (Coustrain 68), McEneff; Byrne (B Kavanagh 86), Finn, S Kavanagh; Greene (Vojic 79). Waterford - Connor; Feely (Poynton 85), Kougoun, Delaney, Lynch; Hery (Akinade 67), Duggan; Chvedukas (Galvin 67), Lunney, Elbouzedi; Drinan.